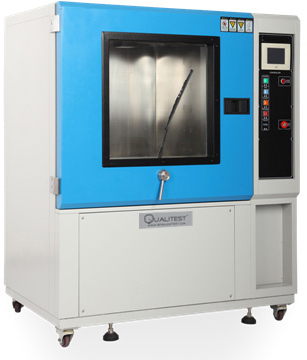 Rain Test Chamber is designed according with the standards of IEC 60529-2001 and mainly used for electronic products to do the waterproof test. Water pump for rain test chambers uses highly pressure stainless steel pump, ensure water pressure and flow of the test cycle, the pump is installed in the side of the IP test device, and both ends of the inlet and outlet to set up the joint, easy to replace and repair. Water tank can be disassembled,The corresponding joint or hose connection is arranged in the water pipe connection. Rain test chambers with water pressure and flow rate adjustable. The IP X3, X4 rain test chamber is suitable for external lighting & signal devices & automotive lamp shell protection test. Inner case’s material is imported steel plates, Shell is made of #304 stainless steel. Water tank uses SUS304 stainless steel, which was installed on side of test devices. The capacity of tank could meet test water.